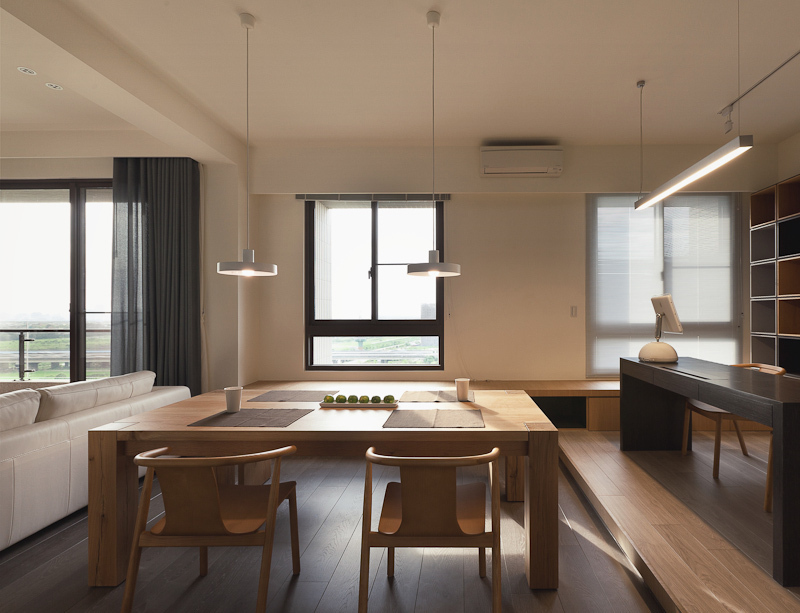 Welcome to today’s gallery, focusing on the Der Xin House, another creation by Taipei-based firm PartiDesign. Modern minimalist design using traditional materials is a signature aspect of the PartiDesign style. 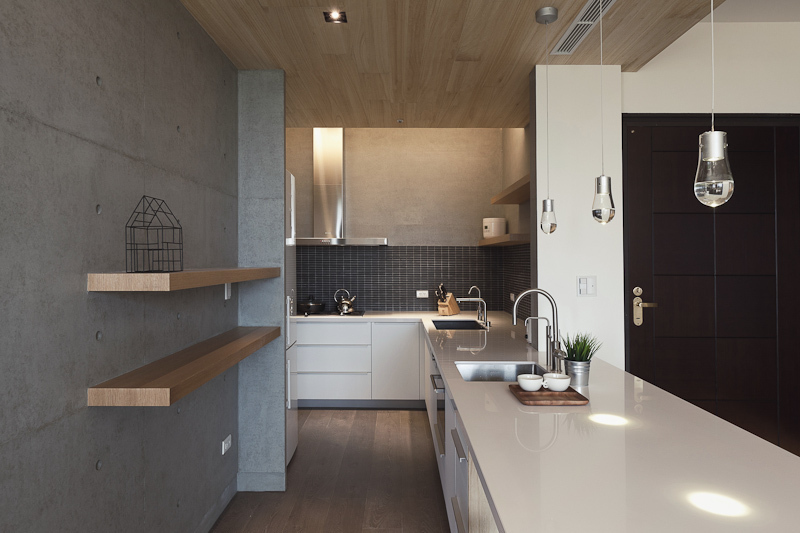 This home inhabits an airy, contemporary space with the use of natural wood, concrete, and spare metallic elements. With an undressed concrete structure as base, the design flaunts multiple tones of natural hardwood flooring throughout. Shelving, storage, and tables reflect this mixture in nearly every aspect possible. 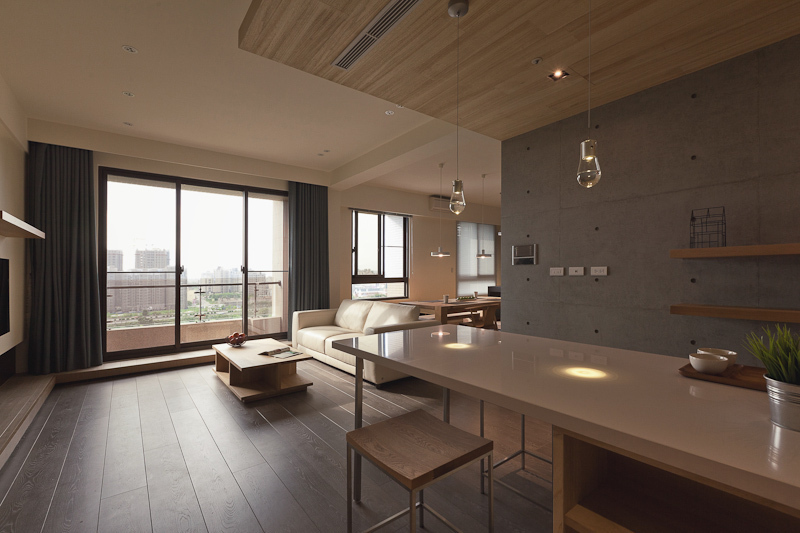 The spare, nearly skeletal theme emphasizes balance and flow, with the major kitchen, dining, and living spaces continuing unbroken. Neutral tones tie every aspect neatly together. Particularly innovative flourishes include striking use of color on bedroom shelving and desk panels, an immense wall of cubic storage in a variety of wood tones, and a master bath flush with dark tones, centered around a large pedestal tub. 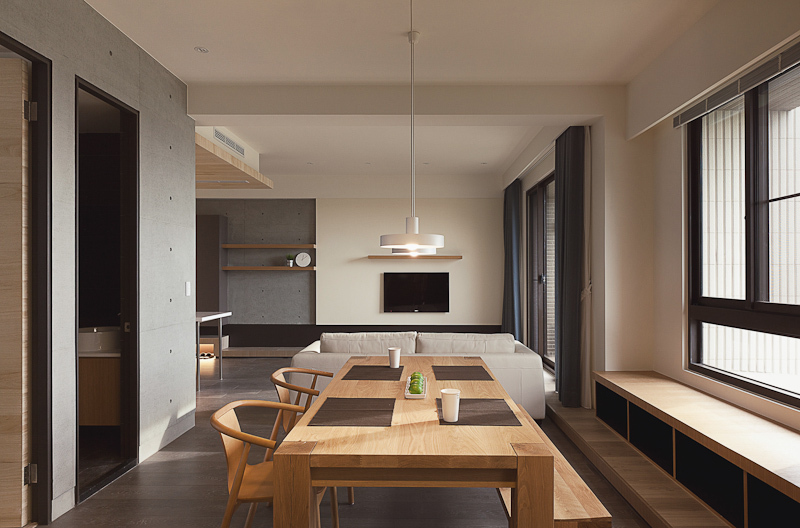 These subtle standout moments pop amidst a cohesive design philosophy running top to bottom in the Der Xin House. This second home continues the Zen-like coherency of style and craft that PartiDesign has shown so far. We hope this space is as inspiring to you as it is for us. 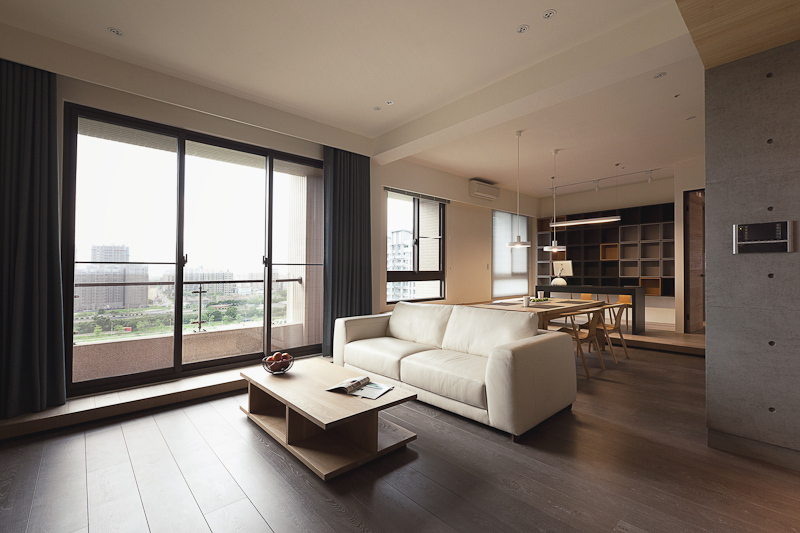 Plus white leather contemporary sofa defines the divide between living room and dining area in the large central open space. 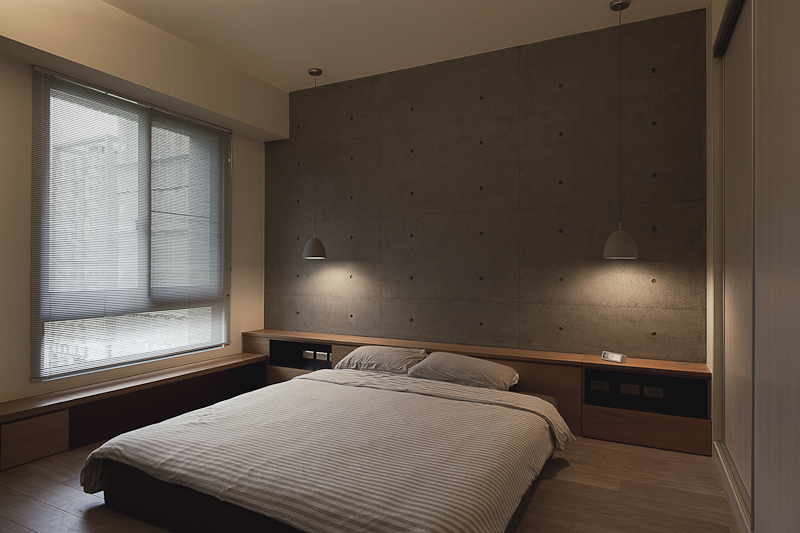 Concrete and white walls wrap the natural tones throughout. 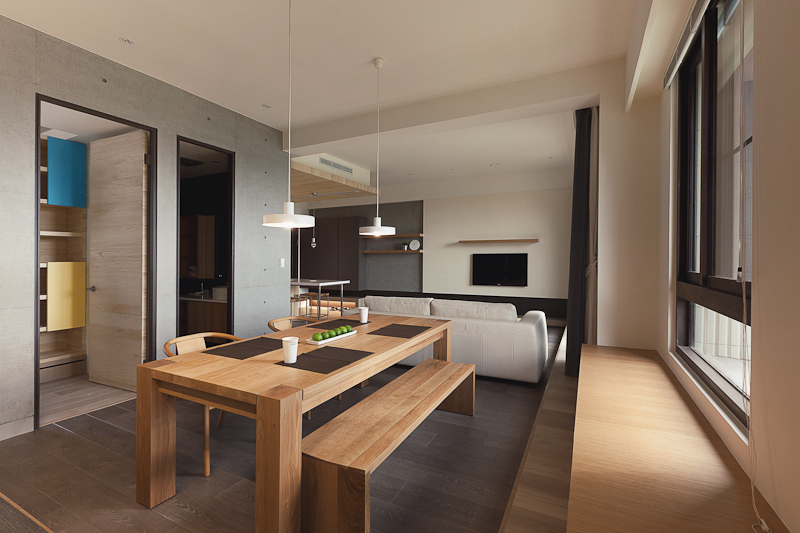 Solid natural wood dining table contrasts with the darker toned flooring in the open dining space. Wood lower shelving runs the entire exterior wall, beneath large window at right. The design throughout stresses continuity and balance. 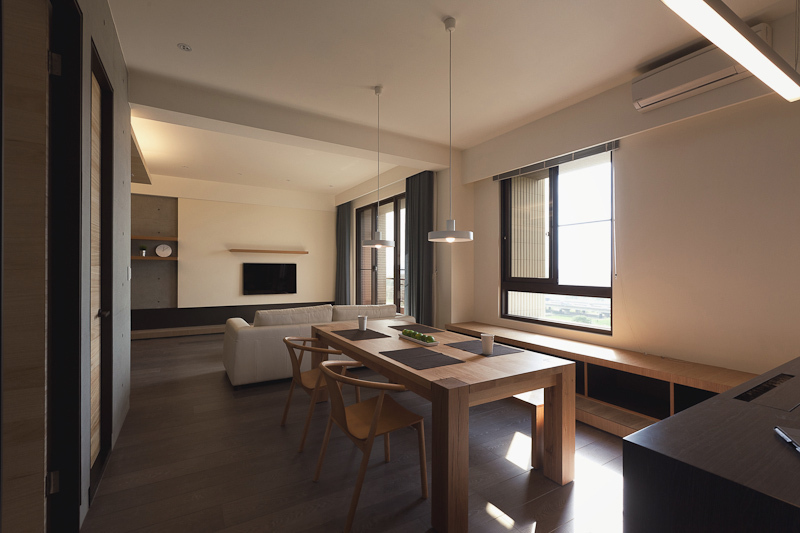 The table, with its pair of matching chairs and bench, lines up directly beneath a pair of minimalist chandeliers, continuing the line directly over the sofa and mounted television. The central concrete structure in the home houses both a bedroom and bathroom next to the dining space, as seen at left. Seen at lower right, a lighter toned hardwood raised floor holds an open office space, with deep toned minimalist desk seen. 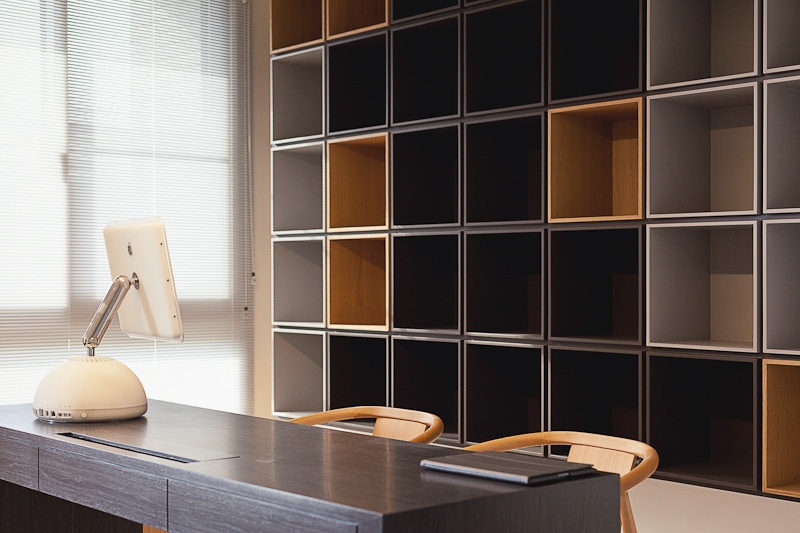 Behind the desk, we see a cubby wall, featuring cubic storage from floor to ceiling in a variety of wood tones. The open kitchen stands beside the main entryway. 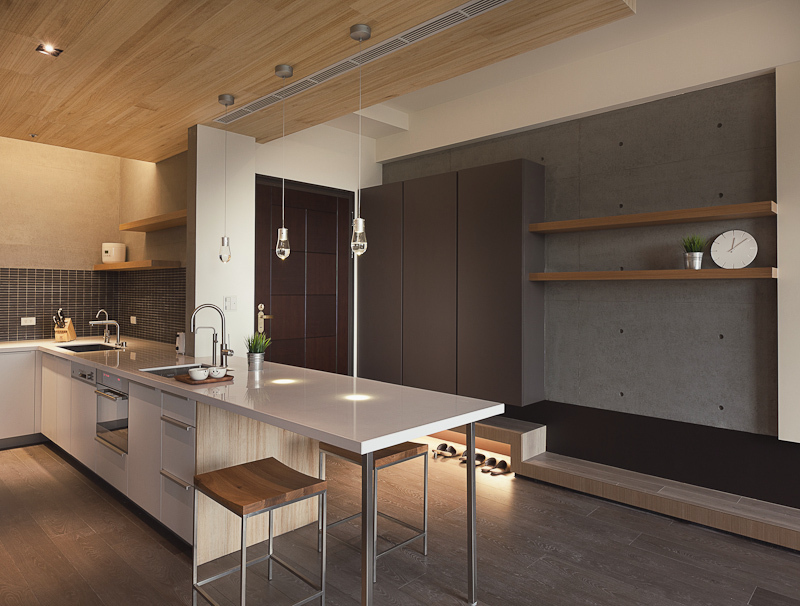 A subtle raised wood platform runs the length of the hall below cabinetry, with underside lighting for shoe storage. Glossy white kitchen counter extends into full dining space, with a pair of metal and curved wood bar stools below. The lengthy countertop includes dual sinks, housing an array of sleek cabinetry below a dark tile backsplash. Simple natural wood plank shelving mounts on the concrete wall at left. 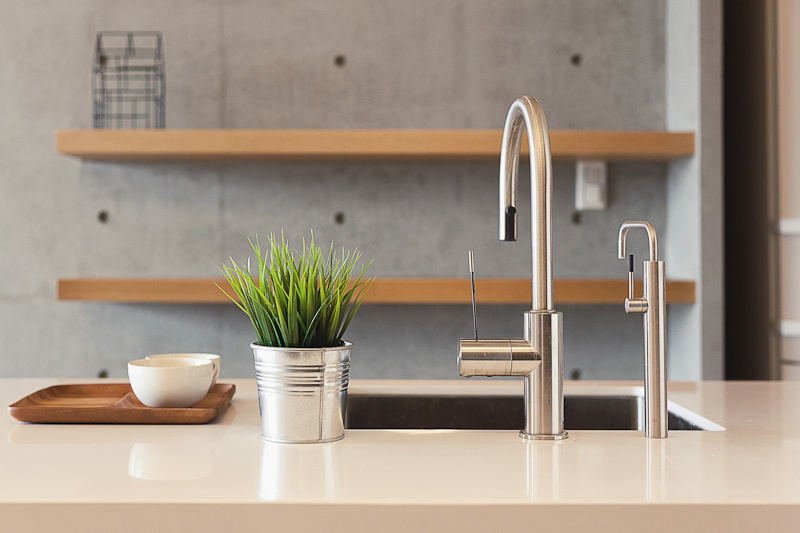 Simple, direct design informs the faucets, complimenting the minimalist theme and contrasting with natural wood tones throughout the home. 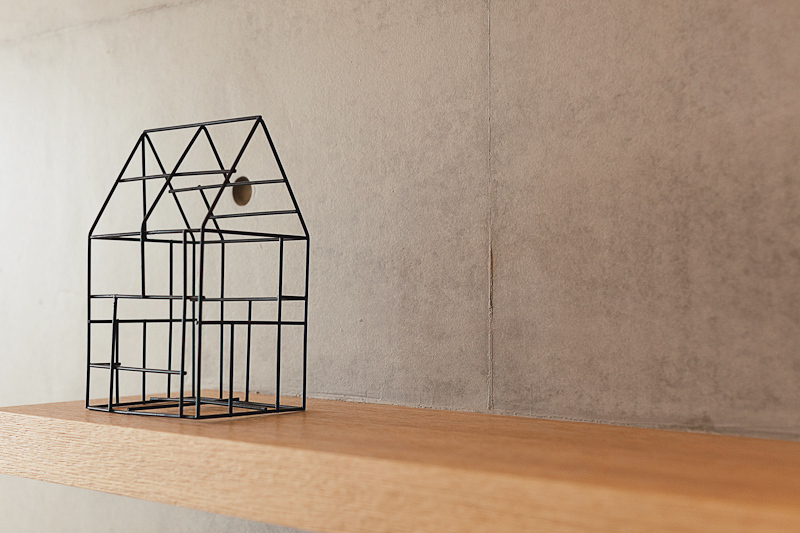 This metal house sculpture compliments the naturally minimalist style governing the home. Cozy bedroom features visually exciting built-in wood furniture in a mixture of natural and bold color tones. 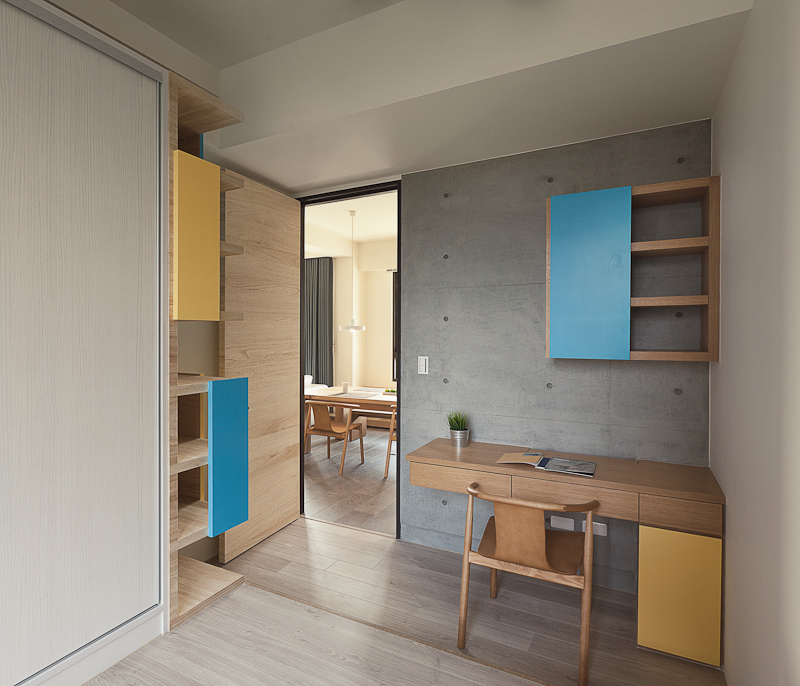 Asymmetrical colored panels mount on shelving and corner desk really pop out amidst the neutral tones. Master bedroom exemplifies the minimalist design, with low height built-in shelving on two full walls, creating a lengthy nightstand for the bed. 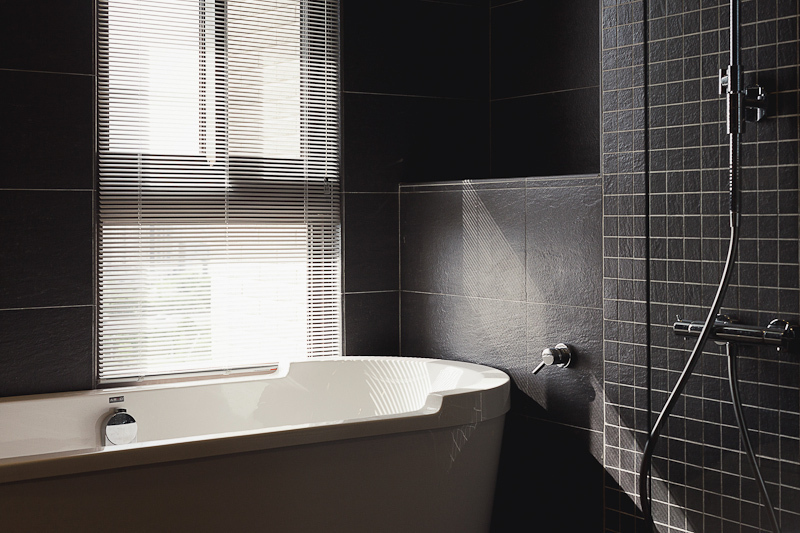 Bathroom stands out in the home, with darker tones courtesy of a stained hardwood flooring and large format wall tiles. Natural wood shelving and white vanity stand across from large pedestal tub in brown with white interior. 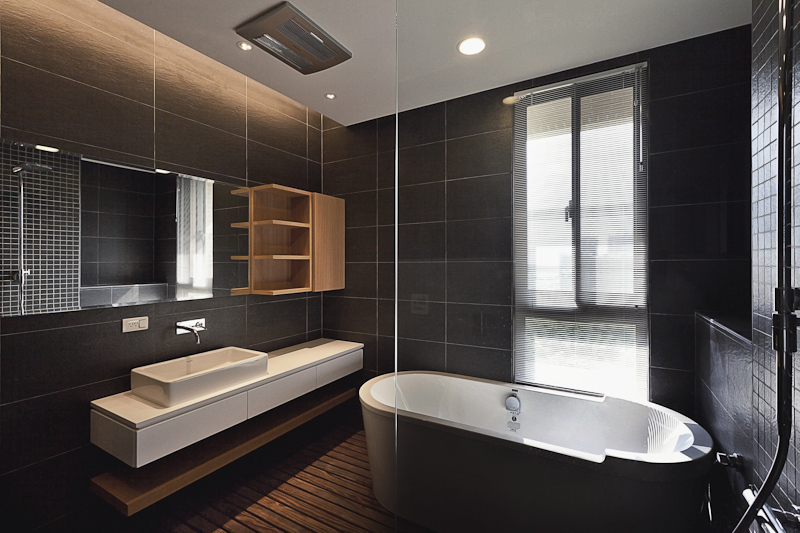 The shower is defined by an all-glass enclosure, with smaller black tiles inside. 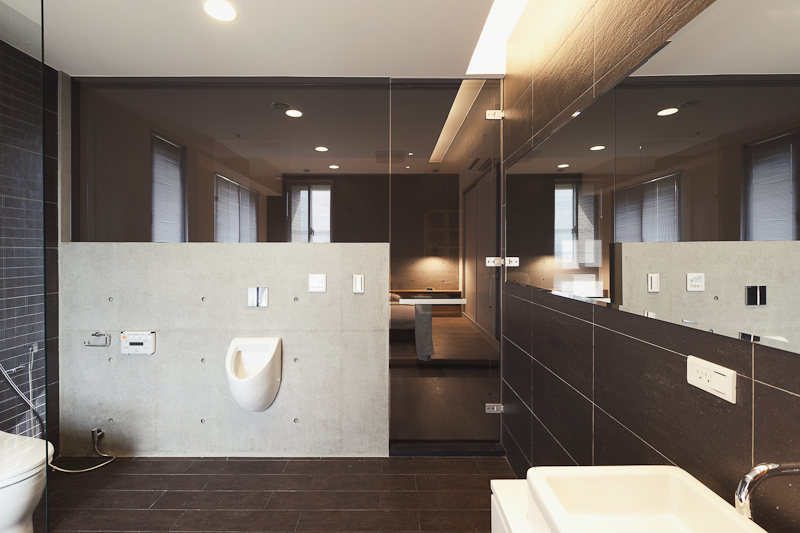 As part of the master bedroom suite, the bathroom is defined by a low concrete wall surrounded by glass panels, including door. Vanity mirror runs length of the space..